In this week's Saturday Sparkle story “Help Is Near” we hear a Russian folktale about three brothers who work together to bring back the King's three daughters from the grips of three nasty serpents. I don't know about you, but fighting three serpents would make me famished, so I hope the brothers had a large stash of pierogies to see them through their journey. What's a pierogi, you ask? Well, a pierogi is doughy dumpling stuffed with filling—like potatoes and cheese—and typically served with sour cream or onions. Think of it as the Russian equivalent to the ravioli. 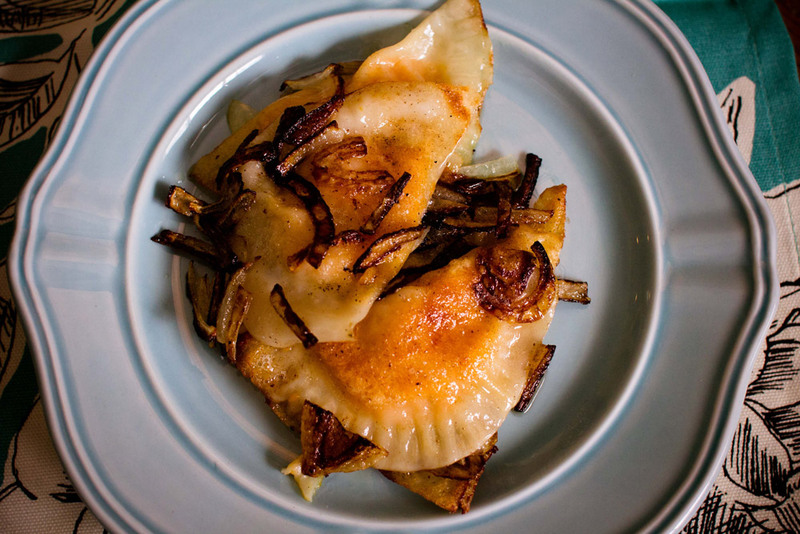 As is often the case with traditional, ethnic foods, pierogies are also a good way to turn leftovers—in this case, mashed potatoes—into a whole new meal. To that end, the recipe below begins with a cup of leftover mashed potatoes. Our family is trying to make the switch to sweet potatoes where we can, so that's what I've used here. We make them with garlic, milk, and butter, but don't stress if your usual mashed potato recipe looks a little different. As long as your potatoes aren't super runny, they'll work just fine. I've also used store-bought won ton wrappers. While they're certainly not as authentic, they speed the process up nicely and they are a credible stand-in for making your own pierogi dough from scratch. One last tip—pierogies freeze beautifully, so don't be shy about making (or even doubling) this whole batch. You never know when you're going to need sustenance for a serpent-fighting quest! In a medium bowl, combine the mashed sweet potatoes with the cheese. Give the mixture a taste to check the seasoning, and add salt and pepper as necessary. Then, using a wide-mouth mason jar lid (or similarly-sized circle) as a template, use a sharp knife to cut the won ton wrappers into circles. Spoon one teaspoon of the sweet potato mixture onto each circle, wet the edges of the circle with a damp finger, fold the wrapper in half, and use a fork to press the edge closed. If you want to freeze your pierogies for later use, arrange them in a single layer on a cookie sheet and freeze for at least one hour before transferring into freezer ziplock bags. When you're ready to cook your pierogies, boil a large pot of water and let the pierogies cook—in batches if necessary—for 3-4 minutes. As they're boiling, melt 4 tablespoons of butter in a skillet and chop up half of an onion. Add the onions to the butter and let them crisp up. When the pierogies are finished boiling, add them to the butter and onion skillet in a single layer, and let them cook there for about 1 minute per side. Arrange the pierogies on a plate, and pour the butter and onions over the top. You can add a dollop of sour cream if you'd like, too, but I find that these are rich enough without it. Imagine – forty minutes of audio each week that not only delights your children, but inspires all sorts of creative play! Subscribe to Saturday Sparkle, and enjoy a new installment each Friday!